Government, environmentalists and even a few businesses want to put an end to plastic pollution, says Fortune's Marc Gunther. NEW YORK (Fortune) -- Paper or plastic? That seemingly innocent question has become surprisingly controversial as environmentalists and governments declare war on what they call the scourge of the plastic bag. The attacks on plastic bags have had a big impact outside of the U.S. Ireland placed a "PlasTax" of about 20 cents on each bag, reducing plastic bag use by about 90 percent. South Africa also taxes plastic bags, and they were banned entirely in Mumbai, India. Now the battles are coming to the U.S. Over the objections of local supermarkets, including Safeway (Charts) and Albertsons, San Francisco is on the verge of passing a city law that would require supermarkets to provide compostable bags - made from paper, corn or potato starch - instead of plastic. Los Angeles officials are studying the impact of plastic bags on marine life, as a prelude to action. Businesses are taking up the issue. The Swedish home furnishings store Ikea says that, starting March 15, it will charge 5 cents for plastic bags, and sell reusable cloth bags at cost, for 59 cents, as part of its "Bag the Plastic Bag" initiative. Ikea will donate the 5 cents that it gets for each plastic bag to the non-profit American Forests to plant trees. What's wrong with plastic bags? Lots. They often wind up as litter, or in trees. They drift into oceans and rivers and kill fish. They can take 1,000 years to decompose. And every time we use a plastic bag, we drive up the demand for oil - which is used to make plastics. According to EPA, which has a Webpage about shopping bags, the U.S. consumes about 380 billion plastic bags, sacks and wraps a year. Fewer than 5 percent are recycled. There is, of course, no mystery about why America is awash in plastic bags: They are thin, lightweight, strong and cheap to make. 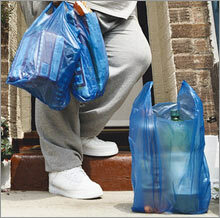 Plastic bags, which were introduced about 30 years ago, now account for four out of every five bags given out by stores. But if almost everyone agrees that plastic bags create problems, there's no clear path to a solution. The grocery store and plastics industries have launched voluntary efforts to reduce plastic bag usage, training employees to pack more goods into each bag. Hilex Poly Co., a big plastic bag firm based in South Carolina, gives its retail customers booklets called "How to Use Fewer Bags" and promotes recycling - a sign that the industry is worried about a backlash, since not many companies try to get customers to use less of what they make. Blumenfeld is now pushing for compostable bags because they can be collected with the food waste that the city already recycles and makes into compost. Plastic bags are unnecessary and a "really, really huge litter issue for the city," Blumenfeld says. It costs taxpayers $90 every time a city worker in a cherry-picker goes out to remove plastic bags from a tree. The supermarkets are fighting the idea, of course. Peter Larkin, president of the California Grocers Association, says a ban on plastic bags is unfair and impractical because it does not affect drugstores or convenience stores and because plastics would enter the city anyway, from the suburbs or elsewhere. Supermarkets have voluntarily cut way back on plastic bag use, Larkin says. He would like to see cities and towns offer curbside recycling of plastic - an idea Blumenfeld rejects as too expensive, and one which would shift cleanup costs from businesses to their customers. Danny Schrager, the president of Mountain Valley Recycling, a Florida-based company that recycles plastics for Wal-Mart (Charts), says retailers and consumers should both take responsibility for the recycling of bags. He says every retailer who gives away bags should agree to take them back, and that consumers should support curbside recycling as well. He says there's enough demand for recycled plastic to absorb a much bigger supply - his firm's resins, made from recycled plastics, can be made into shopping carts, carry baskets, trash pails and a host of other consumer products. "If a retailer provides both the supply and demand, the programs become long-term and sustainable," Schrager says. This is called closed-loop recycling. "Do we clearcut forests, grind them to chips, and pulp and bleach them with chlorine-based compounds (generally carcinogenic byproducts) to make boxes, bags and to-go cups primarily for one-time use?" he writes. That's paper. "Or do we make a pact with demon hydrocarbon, refining ancient sunlight into light, easily compactible bottles, wraps and foams?" That's plastic. "Use cloth bags," Imhoff told me. "Have a bunch of them, and keep them in your car." Yes, it takes a little planning but "if we can't solve these problems by making little changes, we're really in trouble."